Preheat oven to 325°. 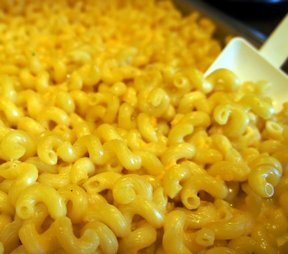 In a large saucepan, add enough water and salt to boil the macaroni. Cook until firm, drain. In the same saucepan, melt 2 T. of butter over medium heat. Whisk in the flour and cook for 1 minute. Slowly add the warmed half & half and cook, whisking constantly, until the mixture is hot and thick, about 4 minutes. Remove from the heat. 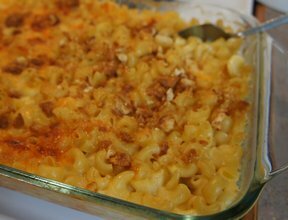 Stir in the cheeses until melted, add the macaroni. Spray a 9x13 glass dish with non stick cooking spray. 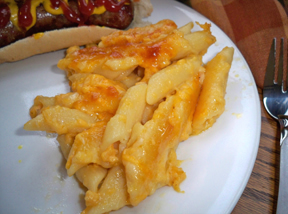 Spoon the macaroni mixture into the dish. Melt 2 Tbsp. of butter and mix with either the crackers or the bread crumbs. Sprinkle on the top. Bake for 20 - 25 minutes.